A timing/flow drill this week. Warning: This drill will chew up ice quickly when done with older players. Two lines start on the same side of the ice (black and red X’s). One player starts on the blue line closest to their line, while one player starts on the dot on the opposite corner of the neutral zone. The players all skate in a circle (red players skate counter clockwise, black players skate clockwise). The player at the blue line receives a pass midway through his tight circle and quickly moves the puck to the player at the far dot. The player at the far dot receives the pass and goes in to attack the net. All players follow their pass – the player in the corner who started the passing sequence moves to the blue line, the blue line player moves to the dot, the player who shot returns to his/her line. This is a continuous drill with players constantly moving from spot to spot. Once it gets moving it self-sustains. 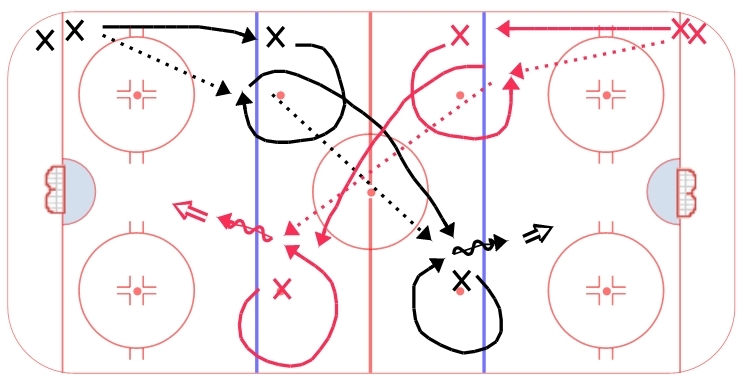 The volume of players skating in circles will chew up the ice quickly so coaches need to be aware and limit the number of reps on each side.